Book carts double as easy transportation of classroom materials and attractive displays. It's best to consider a few important factors before you purchase a book cart for your library or classroom. These factors include shelf style, material, and dimensions. The shelf style you choose depends partly on what types of materials you plan to display in your cart. Typically, book carts have flat shelves, slotted shelves, slanted shelves or a combination of the three. A book cart may also have deep bins. Flat shelves are best for heavy, bulky materials (such as dictionaries), but can be used for any media. Flat shelving isn't the best option for display purposes, as it typically does not have panels to divide or prop materials up against. Slotted shelves are best for picture books, fiction/non-fiction, reference books and magazines. Each slotted shelf can be labeled to maximize organization. shelves make great displays and allow for design variations. Great for fiction, non-fiction and magazines. Bins are great for big books, such as picture books, graphic novels and even reference books. Use bins for "quick picks", or when you don't need to organize materials. 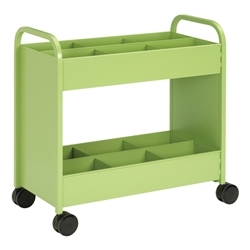 Book carts are most commonly wood, steel or laminate. Wood carts are highly durable and offer a classic look. Laminate carts are lightweight, easy to clean and affordable. Steel carts are versatile and exceedingly strong. Excellent for heavy loads and lighter than wood. 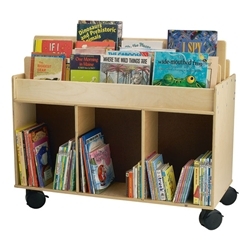 Book carts are available in a variety of widths, ranging from 10 inches to over 40. What size you buy depends on how many materials you need to cart. Remember, oversized materials such as dictionaries require deeper shelves.